The UN Security Council plans to discuss a resolution on Georgia on June 15 which will determine the future of the UN mission in the Georgian breakaway region of Abkhazia. Baki Ilkin, Turkish envoy to the UN, says that the organization has yet to discuss the draft resolution. Turkey, which has been a non-permanent UN Security Council member since October 2008, is sure that the new resolution will regulate the UN presence in the region. “We haven’t had consultations on this topic yet, however we hope that the resolution will be based on the UN Secretary-General’s report. This is a question that requires much consultation between Council member states,” stated Ilkin, as quoted by the UN News Service on June 3. The UN Security Council will begin to address the issue of prolonging the UN mission in Georgia on June 12. The day of the final vote on the resolution, June 15, is the day before the current UN mission’s mandate ends. The Secretary-General’s report was published on May 18 under the title “Report of the Secretary-General pursuant to Security Council resolutions 1808, 1839 and 1866.” The published document called for “a revised security regime” across the Abkhaz administrative border owing to the “erosion” of the previous one, which had been in force for over a decade but was undermined after the August war. The report also appealed for the extension of the demilitarised sea zone and restrictions on vessel movement in this zone. 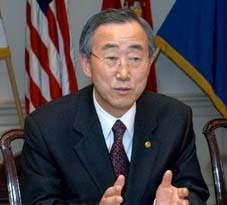 The Secretary-General’s report, mostly welcomed by Russia, was criticised by the Georgian side, which protested at the absence of any mention of breakaway Abkhazia being part of Georgia. Furthermore, the name of the UN mission has been changed from “UN Mission in Georgia” to “UN Mission on Stabilisation.” This verbal formula has gained the support of Russia, which has said that the report “considers the realities created in the region after the August conflict.” Several Georgian officials, including Georgian UN envoy Alexander Lomaia, have accused Russia of “blackmailing” the United Nations. Meanwhile the OSCE is also planning to discuss the future of its mission in Georgia. According to information from the Georgian Foreign Ministry, the OSCE Permanent Council will discuss the extension of the OSCE Mission in Georgia and the fulfilment of the August war ceasefire agreements by Russia in Vienna. “Georgia will use all existing levers to let the international community know the real situation on the occupied territories [of Abkhazia and South Ossetia],” stated Paata Gaprindashvili, Georgian Representative to OSCE, on June 3. In May 2009 Greece, as the current OSCE Chair country, suspended the negotiations on the prolongation of the OSCE mission’s mandate in Georgia. The suspension was caused by Russia’s decision to veto the draft resolution on the extension of the mission. Russia is demanding the creation of a separate mission for Georgian breakaway region South Ossetia, as the Kremlin has recognised it as independent. Georgia has protested against this initiative and stated that Russia wants to hinder international monitoring in Abkhazia and South Ossetia because this would report the “violations of human rights and humanitarian catastrophe” being created by increased Russian military presence in the region and the actions of the Moscow-backed separatist authorities.